2005-06-28 06:25Z: As forecasted, the wind turned in the morning. After a few miles of rowing, we’re finally under sail in a small rain. 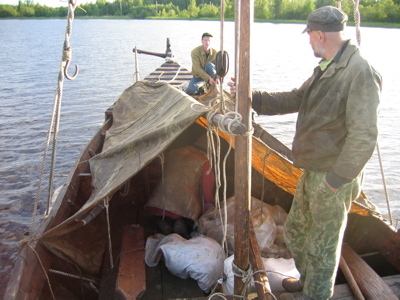 2005-06-29 06:50Z: The night’s sailing has been succesful, and now when the wind died we float near the north end of Onega. 2005-06-29 12:05Z: During the day the wind died and we’ve been floating and cooking food on Povenets bay 29km from city. Disturbing thunder in the south. 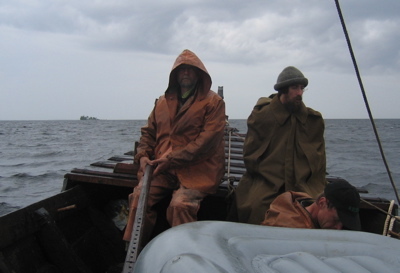 2005-06-29 15:05Z: When a boat of locals came to check us out, our old believer (Staroverts) Feodosi told them we’re tatars sailing north from Astrakhan. 2005-06-29 16:45Z: Povenets in sight. An impregnable wall of dragon-shaped rainclouds speed at us from south and a big fishing boat came to check us out. 2005-06-30 10:10Z: We need to be towed through the Stalin’s channel and arranging that will take some days, so I’ll leave the ship here and head home. 2005-06-30 10:30Z: Before departure we need to get Fredrik’s moped out and the strong north wind prevents us from rowing ashore. 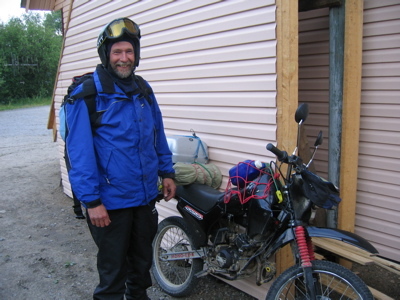 2005-06-30 10:30Z: The trip on Shnjaka has been a very rewarding one. 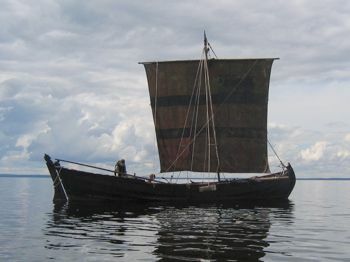 I doubt if similar ships have sailed here since Viking raids a thousand years ago. 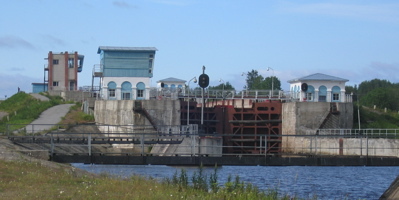 2005-06-30 14:25Z: Povenets was the east frontier of the WW2 Great Finland. 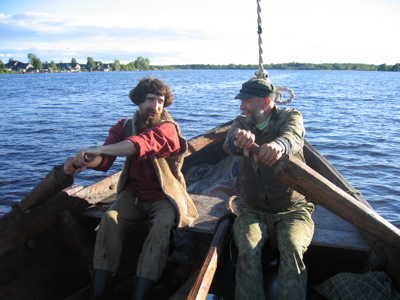 I’m looking for a ride to Medvezhegorsk, thus ending the Viking adventure. 2005-06-30 21:40Z: The lady at the railway station was most helpful, arranging me tickets in the sold out St. Petersburg train and allowing me to recharge.